Brazil international Fabinho has indicated that he is not seeking a potential exit from Liverpool amid the recent speculation linking him with Paris Saint-Germain. The 25-year-old was the Reds' first signing of the summer after making the switch from AS Monaco and he was thereafter expected to cement a regular role in the starting lineup. However, things have not paved the way as planned with him taking time to adapt to the English game and he has managed just four starts in the Premier League to date. Amidst this, he has been constantly linked with a winter move to Les Parisiens but speaking to UOL, he has stressed that he has no ambition of parting ways with the Reds in the near future. He said: "I was told there was something in the press, but I never said I would like to leave Liverpool. I was aware that I needed to have the patience to wait for my moment, but I'm happy at Liverpool - there's no reason for me to leave." 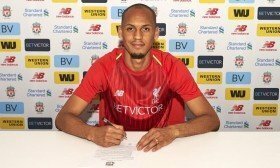 Fabinho recently featured for the Reds during the 1-0 derby win over Everton in the Premier League but it remains to be seen whether Klopp will pick him from the off for the away trip to Burnley.